Collects Immortal Iron Fists #1-6. 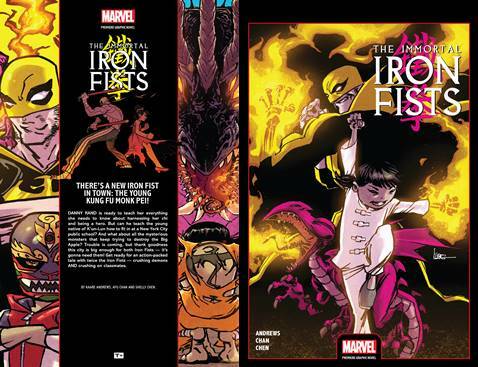 There's a new Iron Fist in town: the young kung fu monk Pei! And Danny Rand is ready to teach her everything she needs to know about harnessing her chi and being a hero. But can he teach the young native of K'un-Lun how to fit in at a New York City public school? And what about all the mysterious monsters that keep trying to destroy the Big Apple? Trouble is coming, but thank goodness this city is big enough for both Iron Fists - it's gonna need them! Get ready for an action-packed tale with twice the Iron Fists - crushing demons AND crushing on classmates.